St. John's Lutheran Church > Blog Timeline > Senior Ministry > Big Sale at Season’s Gifts! Big Sale at Season’s Gifts! So, if you had an epic fail shopping experience this year and need to make amends to someone for giving them something other than a perfectly amazing Christmas gift, you are graced with a second chance to purchase the perfect thing from Season’s at HALF PRICE! Just meander to the back of the shop and you will find several sections of shelves dedicated to discounts. On sale now are bath and body items that are both charming and healthful. Every girl needs to be pampered in her own home and we have just the items to sooth, smooth, and ooze comfort. For foodies, food items by Vivian Howard, including high end gourmet seasonings, and glazes that will freshen an old recipe are available for purchase. Several flavors of the ever delightful, but warm Blowin’ Smoke Sauces are in stock at half price, as well. And to extinguish any thirst, there are organic teas from Tea for Two. But get there soon, as these products are hot and expected to be gobbled up fast! Household items such as figurines and decorative items are also on display at half price. Be sure to look out for crosses and containers, pillows and prints, blessings and birds. Most delightful is a CD by our own Ondria Durocher Witt entitled, Songs Along the Way, recorded in a studio and some written by herself and Rob Durocher, her father and St. John’s Music Minister. And the Vintage Addiction “military tent” canvas bags are the real deal, truly fashioned from retired military tents. 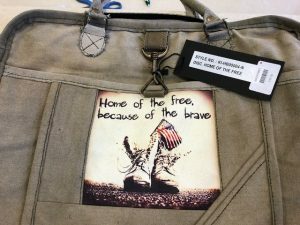 Celebrate our troops and our love for totes, purses, carry-all’s, and Ipad covers as well as other shapes of bags that can make life a great deal more organized and spark nostalgia as we travel from grocery to home, or across the globe and return. Remember the saying, “Home of the Free because of the brave”? Well, Season’s has it on a bag just right for someone you know! 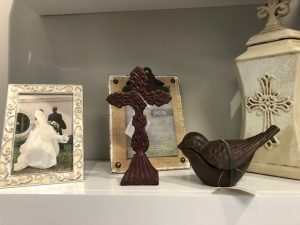 For the thrifty among God’s Kingdom, drop in to pick up cards, nativity scenes, ornaments, and serving plates to make next year’s Christmas celebration as merry as possible. Savannah Bee products have been a success at the shop for some time and now are going to be vanishing as if on wings. The Bee products are parent products to Honey Buns, which are Bee products for babies! A zippered “pouch” includes lovely items appropriate for shower gifts (hint! hint!). Other child oriented gifts are a selection of SigiKids colorful stuffed characters, also appropriate for you-know-who. Assorted photo frames are appropriate for any age or gender and always, always make an excellent gift or can be purchased simply by the vain and self-absorbed, for the vain and selfabsorbed (not calling any names). I don’t have to tell who I’m buying for, you know. And with Old Man Winter moving in and setting up housekeeping in the South, there is a great assortment of winter scarves of various wools and cashmere. Solids and plaids, some resembling the ever-popular Barbour fashion plaid, are available. But those going on a winter vacation may want to check out the lightweight Spring scarves, slashed as well. Remember it is a half-price sale, but look for the red tag to be sure that you are getting the best price!